Until recently anime was pretty much reserved for geeks who treasured their dvd copies of Akira and Ghost in the Shell. The rest of the world ignored them and got on with their lives. Cartoons, after all, are for kids; we might have fond memories of Bambi and the Jungle Book, but we wouldn’t watch a cartoon in the cinema. And Harvey Weinstein, nobody’s fool, released a Japanese film called Princess Mononoke in the USA. Pigs are a frequent feature of Studio Ghibli films. In Princess Mononoke, the Demon that curses Ashitaka is an enchanted boar. In Spirited Away, Chihiro’s parents quite literally make pigs of themselves, and are turned into pigs. Porco Rosso is the tale of an heroic pilot has been turned into a pig. The films frequently make reference to nature and pollution by man. Princess Mononoke is the most obvious example, with the forest gods pitted against the humans who are despoiling their land. Yet the gods are led by a human being, and the humans from the mining town are themselves refugees – the battle is complex and realistic. Most of the Studio Ghibli films feature humans entering strange or forbidden lands: the floating islands of Castle In The Sky, the forests in Princess Mononoke, the land of the spirits in Spirited Away, the Cat Kingdom in The Cat Returns. 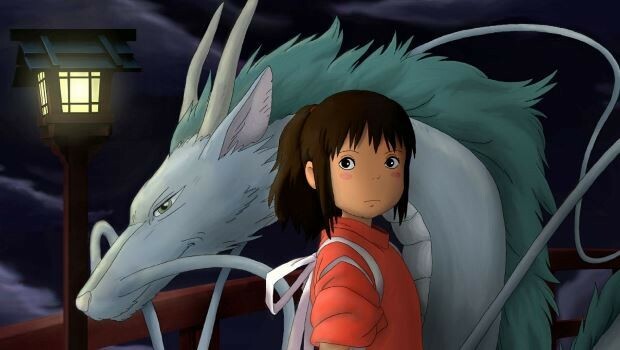 The protagonist is often a young female (Haru in The Cat Returns), though sometimes the films feature a male and female pair, one of whom has a magical or unusual past (San and Ashitaka in Princess Mononoke, Chihiro and Haku in Spirited Away), who has to break the spell and return home. Rule Number Three: Labour is liberating. At the beginning of Spirited Away, Chihiro is a sulky, spoilt, timid child. When she finds herself alone in the spirit world, she goes to pieces until Haku tells her that in order to survive, she must get a job. In the beginning, she is clumsy and slow, but gradually becomes competent, and as she grows in confidence gains the skills and friends that she needs in order to confront the witch Yubaba and free her parents and Haku from the spell. Many of the Ghibli films involve hommages to working class people and the female protagonists are often forced to spend time cleaning monumentally dirty residences. As Miyazaki and his partner, Isao Takahata, came of age in the post-war era, this emphasis on work as empowering should come as no surprise. Japan dragged itself up by its bootstraps and made itself the envy of the world through sheer hard work and a unique relationship between the individual and the employer. In Spirited Away, once Yubaba gives Chihiro a job, she is obliged to look after her – Chihiro becomes part of the bathhouse family. Chihiro riding on Haku’s back, then freefalling; Haru and the Baron treading daintily down the walkway of crows; Kiki making deliveries on her broomstick; the cat bus, and Totoro’s spinning top. One Ghibli film that falls outside these rather arbitrary ‘rules’ is Grave of the Fireflies. Most Ghibli movies are fantasies, charming, often profound, but they’re fairy stories. Grave of the Fireflies, set in during the last days of the Second World War, is not. It’s the story of Setsuko and Seita who, when their mother dies, struggle to survive on their own. It’s terribly moving and tragic, like a Japanese When The Wind Blows. Optimum Releasing are proud to present The Studio Ghibli Collection which includes: Laputa: Castle in The Sky: Special Edition (released to DVD on 27th February); Kiki’s Delivery Service: Special Edition (released to DVD on 27th February); My Neighbour Totoro (released to DVD on 27th March); Princess Mononoke: Special Edition (released to DVD on 27th March), as well as Howl’s Moving Castle (13 March). The Art of Miyazaki’s Spirited Away – Hayao Miyazaki. The Anime Encyclopedia: A Guide to Japanese Animation Since 1917 – Jonathan Clements, Helen McCarthy. Nausicaa of the Valley of the Wind (1984) – ‘Georgeous’ Korea Times. The Castle of Cagliostro (1980) – ‘a clever and charming mix of romance, comedy, adventure, and action’ DVD Times. My Neighbour Totoro (1988) “A classic children’s film from the master of Japanese animation” Robert Roten, LARAMIE MOVIE SCOPE.